If you are looking for the most common engine problems, this post should help! When your engine fails, it isn’t a good thing. Not only will your car be down, but it can be hard to diagnose and even harder to repair. Whether your engine is making weird noises, misfiring, or overheating, the cause could be one of many issues. You shouldn’t think of the check engine light as a death omen for your car, but you should think of it as an indication that something on your car needs some attention. Your car diagnostician may find any of the issues below. Missing or loose gas cap. Replacing or tightening the gas cap is going to be the cheapest and easiest fix for your car in its lifetime. However, it is also important. A missing or loose gas cap can cause your gas to evaporate from your car, which decreases the gas mileage which could cost your hundreds of dollars. It may be small but its important. The spark plug is what makes your vehicle move forward. It has a function to ignite compressed gas within your engine. Worn spark plugs will make a weak spark which may prevent your engine from igniting or cause it to do so during the wrong stage. Misfiring will affect your engine and gas mileage and can cause a lot of damage. Dirty coolant may cause many issues. If your radiator gets filled with sediment from dirty coolant, then it can cause your engine to overheat. Your radiator can get corroded if you use hard water in it. Normally coolant loss is the most common reason for overheating. If your engine is constantly overheating, then the high temperature could cause major damage that can’t be repaired. Prevention is the best treatment, so avoid this damage by ensuring that the coolant is clean, and that the cooling system is in good condition for operating. If fuel and air aren’t properly compressed, your engine can’t complete the combustion process. If the valves aren’t being sealed properly, the piston rings are worn, or the cylinder has a hole, there could be an air leak which causes lack of compression. Faulty or broken oxygen sensor. This sensor measures just how much oxygen hasn’t been burned in the exhaust. It will then tell the data system just how much gas is in the gas tank. A problem with an oxygen sensor means that your car gets incorrect information. This often causes lower gas mileage. This is a type of combustion that is caused by the build up of too much pressure and heat in the combustion chamber. Whenever this happens, you will hear a pinging or metallic knocking noise. A small amount of this won’t cause any major damage but the heavy knocks and prolonged detonation can cause some major damage to the engine. It can crush rod bearings, crack rings, punch holes in the pistons, pound out piston ring grooves, and even blow a head gasket. Prolonged knocking noises are a certainly something to be concerned with. Oil can even build up can leave some nasty deposits on the spark plugs, combustion chambers and intake valves. It can be ruing the bearings by leaving debris which will embed on the surface. If the oil filter is missing or clogged, then this could be problem. A failing oil pump can cause oil starvation which will damage any engine. Overhead cam engines are at risk for this, because the valve train and cam are further from the pump than a pushrod engine. Oil needs to be the proper viscosity which means it needs to be light enough to move fast. Your car will need oil between moving parts. Not only does this reduce friction, it also removes heat. Having a regular oil change is important to the functioning of your car. Failing to make sure you have proper lubrication can cause your car to overheat and the parts to seize up, so keep your oil at the recommended level. Low levels could mean burning or a leak. The first and maybe most obvious thing is if you’re out of fuel. If it’s on “E” then you’ll need to head on down to a gas station. There can be a problem with your vehicle’s air intake. If the intake isn’t letting air into your engine, it cannot operate properly. There can also be problems caused by water that’s got into your gas tank. This will cause the fuel to not ignite. Lastly your vehicle may be running “rich” (too much gas) or too “lean” (not enough gas) in the air/fuel mixture. We’ve all heard people talk about blowing an engine, but what does that mean? It’s easiest to understand a blown engine as any type of damage or failure which requires an overhaul or replacement of the engine. There’s a number of various components that once damaged constitute serious enough repair that most would agree it’s “blown”. One of the most obvious signs that you’re engine is blown is when the engine block cracks. The engine block is the larger housing that defines the internal combustion engine. If it cracks the engine cannot contain the pressures of fuel exploding and pushing the pistons to produce power. Signs to watch for include if your vehicle is overheating, if you have white smoke coming from the exhaust, and if you see coolant leaking from the side of the engine. The pistons are what does the heavy lifting of producing the power to move your vehicle. They go up and down within the cylinder walls and the rings close up the gap between the piston and the walls. If any of this is damaged the engine will have serious failures and need to be repaired or replaced. Symptoms to watch for with your pistons, rings, and cylinders are loud rattling sounds, blue smoke in exhaust, oil caps popping off, when your engine won’t idle smoothly, and if you fail an emissions test. Other components in your engine that transfer the power from the pistons such as the rods, bearings and pins will cause a blown engine if they fail. Things to watch for include tapping and ticking sounds, low oil pressure, pulsing, metal shavings in the engine oil, throwing a rod (extremely dangerous), and rattling when you accelerate. Your check engine light can be an anxiety trigger for any driver. It could mean anything from a missing gas cap which is a cheap and easy fix to needing a major repair which can be expensive. The whole issue is that it can be made worse by the fact that most car owners don’t really have a great sense of how their engine works. What can be more confusing than a large jumbled mess of metal, tubes and wires? Here is a breakdown. Your engine works from the inside of your car, which is why its call an internal combustion engine. Basically, the job of the engine is to convert the gas into energy, which makes your car go. In the newer hybrid and electric cars, the energy source is going to be different, but the outcome is still the same. The same goes for diesel engines. It is just a universal truth: Without a working engine, your car is going to be a heavy and useless pile of metal. Having regular maintenance could seem to be pricy, but it is also important to do to keep your car in good working order. If you want to get the most out of your car, then ensure that you keep up with getting routine oil changes and other various maintenance and be sure to address other problems that occur as soon as they happen. 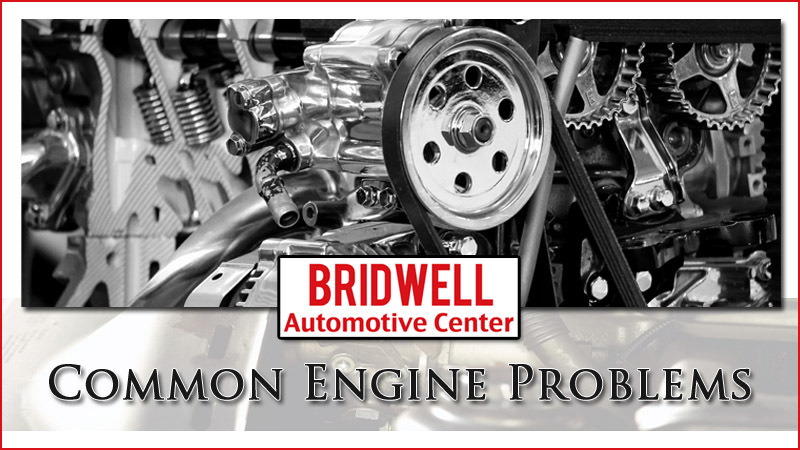 If you are having any other above engine problems in Scottsdale, Bridwell Automotive Center can help! 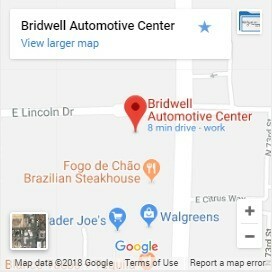 Bridwell Auto offers trustworthy auto repair in Scottsdale to help keep you out on the road safe as possible. For more information about our ASE Certified automotive repairs please contact us. You can ask about our services, schedule and appointment and get our trusted and professional inspection done so you know what you’re up against. How Much Does Shock & Strut Replacement Cost?